Operating a vehicle takes a tremendous amount of concentration, which is why distracted driving is the cause of so many devastating accidents. In the state of Kansas, driving while distracted is one of the leading causes of auto accidents that result in wrongful death. The Brave Law Firm attorneys of Salina, KS have seen firsthand how distracted driving accidents affect the lives of clients. More needs to be done to discourage this careless and dangerous act. Distracted driving continues to be such an ongoing problem, because people underestimate the severity of the issue. Distracted driving is as dangerous and destructive as drunk driving, but it doesn’t carry the same negative social stigma. Unfortunately, most people see no problem with “multi tasking” behind the wheel. Over 50% of drivers admit to talking on the phone or texting while they drive. The growing use of portable devices such as iPads, iPods, computer tablets and MP3 players further adds to the growing number of hazardous distracted drivers. External distractions are also a serious problem for drivers. This can be anything happening outside your vehicle that takes your attention away from the road. When you’re busy looking at an accident scene, construction site, or watching a sunset, you are driving distracted. There are also other distractions within the vehicle itself. Passengers who engage in loud conversations with the driver, or children arguing in the backseat are all creating dangerous driving conditions. 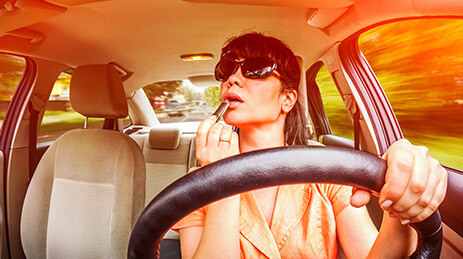 Drivers can also distract themselves when they attempt to eat, drink, adjust the stereo, apply makeup, or read their GPS. All of these distractions are putting you and other drivers at great risk. The only thing you should be doing behind the wheel is concentrating on the road. There are Kansas laws that attempt to curb cell phone use while driving, but the laws have severe limitations and fail to address the larger issue of distracted driving. If you’ve been the victim of distracted driving, please call our Salina, KS attorneys. Brave Law Firm has the experience and talent necessary to win you the fair compensation you deserve. Our attorneys of Salina, KS are ready to serve you!